A few weeks back, we took a look at the Foscam C1 and compared it to Nest Cam quite a lot. We found the C1 to be good for what it is, an inexpensive IP camera. But its cloud features were limited and required manual port forwarding for remote access. For this review, I am covering the Nest Cam in more detail, including its great app. The ease of the app and its great features are really its special sauce and why you might buy it vs. the C1. The present Nest Cam is the third camera descended from the original DropCam and brings better resolution (1920x1080 vs. 1280x720) to the table over the previous DropCam Pro. The image below shows Nest Cam callouts, although it's really more for reference since you don't see the features. Hidden near the lens are 8 IR LEDs, speaker and microphone. Nest Cam has a comprehensive set of mounting options. The camera has a magnetic base for mounting and can also be screwed to the wall. Or you can just twist it off the base and mount it on any univeral mount or tripod with a standard screw thread. With these mounting options, the camera can be easily twisted and tilted in to every conceivable direction to get the viewing angle just right. The image below shows the different mounting options. I collected all of the information I could about Nest Cam from their tech specs into Table 1 and included the Foscam C1 specs. 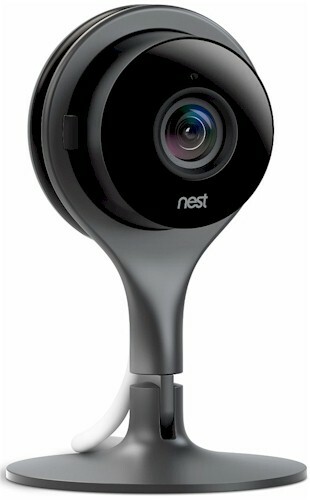 The Nest Cam is a 1080p HD camera and I confirmed the videos from the camera downloaded at 1920x1080 resolution. The camera connects by 2.4 or 5 GHz N150 class Wi-Fi. Inside the box, you get a microUSB cable, wall-wart USB charger, Nest Cam, mounting bracket and some mounting screws and the Quick Setup card, which I've shown below because I adore its simplicity. "Pick a spot and plug it in...It should only take a minute. Literally."